The blockbuster children's movie Mr. Magorium's Wonder Emporium has arrived on DVD, written and directed by Zach Helm (Stranger than Fiction) who is the "helmsman" of this film. The story revolves Mr. Magorium (Dustin Hoffman) who has run his magical toy shop for more than 150 years, by his own count. He has made toys for Napoleon, Lincoln and any number of famous historical figures in his lifetime. Now however, it is time for his career to come to an end and indeed his time on this earth. Before he leaves however, Magorium wants to make sure that his magic toy store is well taken care. Ever since she was a young piano prodigy to the time she became manager of the toy shop, Molly Mahoney Natalie Portman) has been unknowingly groomed to take over the store. Now that Mr. Magorium is leaving he wants her to have the store. Molly has never had a moments doubt about the magic of the store but her failure to write a grand piano concerto after years of being a prodigy have left her with no belief in the magic within herself. Thus why she refuses to accept Mr. Magorium's offer of the store, and she is especially not ready for him to leave. Meanwhile Magorium hires an accountant, Henry (Jason Bateman) to look into the stores finances and discover the magic himself. Just the kind of film that one would assume was adapted from a kids book, it has that much imaginitive detail, Mr. Magorium is entirely the creation of Zach Helm. He was inspired by his time working in a toy store before Hollywood came calling. Assembling a top notch cast, including Stranger Than Fiction co-star Dustin Hoffman and the ethereal Natalie Portman, Helm creates a flawed but good natured family flick without the saccharine taste often attributed to the genre. 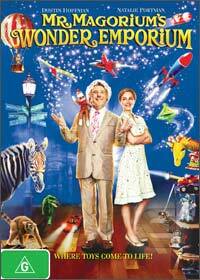 Mr. Magorium's Wonder Emporium is the kind of family entertainment you won't mind the kids picking up on DVD or catching on cable on a Saturday afternoon. It's harmless and playful and full of imagination and colour. That's more than you can say about a number of the so called 'family movies' we've seen in the past few years.